Welcome to the Shepherd's Grove Cavalier King Charles Spaniel Gifts page. You will find a number of our handmade pottery items, decorated with Cavalier King Charles Spaniels. We offer four coat colors: Blenheim Cavalier, Tricolor Cavalier, Ruby Cavalier and Black and Tan Cavalier. Does your dog have a different coat color or pattern? We've got you covered. You can have your King Charles Cavalier gifts customized with your dog's colors and markings by using the "custom color" option on the item page (a small art fee is applied for all custom work). Our Cavalier King Charles Spaniel merchandise includes: Cavalier Spaniel mugs, wine stoppers, sugar bowls, creamers, dipping bowls, and treat jars. And the list is ever expanding. All of our Cavalier King Charles Spaniel items are made in small batches in our Eureka, CA, studio. So you receive the benefit of buying something unique, American made, and infused with all of the joy that is part of the creative process. 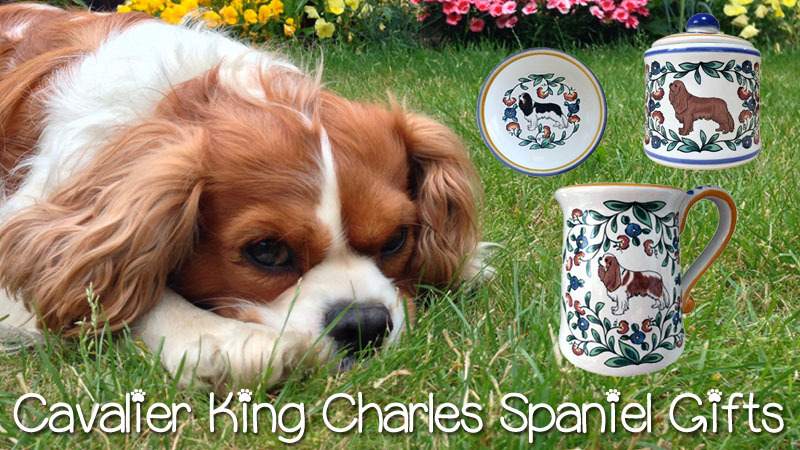 And because our King Charles Cavalier gifts are made of stoneware, you are also buying something that is very durable and can be enjoyed daily. Feel free to use our products in the microwave, oven, and dishwasher – they are intended to make you smile, both because of the Cavalier design, and because of their ease of use. Cavalier King Charles Spaniels have a very distinguished history and a name that reflects it. King Charles II (King of England during the mid-late 1600's) was very fond of this breed and renamed it in his honor, hence the "King Charles" part of the name. A "Cavalier" is anyone loyal to the King – as the King must have felt his four legged friends were very loyal indeed, "Cavalier" was added to the name. It just goes to show, that no matter how noble your blood, or how high your position, your heart can still be melted by the warm, kind eyes of this sweet dog. Dante and I are very lucky to have Cavalier King Charles Spaniels among our friends. Especially Cricket N' Higgins, two very sweet Cavalier's in Ventura, CA, who obligingly pose for thier mom, Kathy, as she captures them in cute and colorful photos. Shop our Cavalier King Charles Spaniel gifts and let us make something special for you!